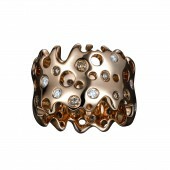 The Star rings emphasize individuality by comparing the stars to humanity. I strongly believe that everyone can make a diﬀerence by embracing their uniqueness and believing in themselves, and I wanted to share this value through my creations. The Just Rebel Star collection is a symbol of individuality. All rings are similar but at the same time different from each other and there are no two ones alike - made by hand they all have different shapes, different colours of gold and diamonds. Each ring is set with a specific number of diamonds that has a symbolic meaning to me, for example the Dream Me and Love Me rings are set with 32 and 84 diamonds respectively which corresponds to my birth date. The organic shape and natural feel of the rings make them perfect for everyday wear while the highest quality brilliant cut diamonds add a sparkle that would be well suited for a more formal occasion. I started working on the design when I was a student at GIA, Carlsbad, CA, in 2010 but released the first pieces to the public in 2015 for IJL fair in London. All models were created by hand using the traditional art of wax carving. The challenge was to carve a unique freeform ring to give it an organic and well balanced shape but also to map out the placement for the drillings that would look random but in fact were carefully arranged to create the perfect combination between the weight, thickness and size of the ring to make it comfortable to wear. Image No1: Photographer Simon Martner, 2016. Image No2: Creator Katerina Perez, Photographer Simon Martner, 2017. Image No3: Photographer Simon Martner, 2016. Julien is driven by a desire to unite humanity and leave a positive footprint on the world. Created with his signature integrity, intuition, and instinct each piece of JRS jewellery bears the hallmarks of their creator. Delicately detailed and imagined in finely wrought craftsmanship, they deliver a heartfelt message to be remembered for generations to come. 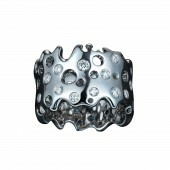 Just Rebel Star Rings by Julien Riad Sahyoun is a Nominee in Jewelry, Eyewear and Watch Design Category. · The profile and other works by Julien Riad Sahyoun is also kept secret. This information will also be available later. Just Rebel Star Rings by Julien Riad Sahyoun is Winner in Jewelry, Eyewear and Watch Design Category, 2017 - 2018. · Press Members: Login or Register to request an exclusive interview with Julien Riad Sahyoun. · Click here to view the profile and other works by Julien Riad Sahyoun. 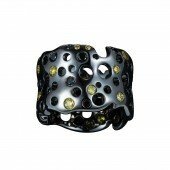 Did you like Julien Riad Sahyoun's Jewelry Design? Did you like Just Rebel Star Rings? Help us create a global awareness for good jewelry design worldwide. Show your support for Julien Riad Sahyoun, the creator of great jewelry design by gifting them a nomination ticket so that we could promote more of their great jewelry designs.